I love these shades. I am following you on Pinterest now :) I would love for you to share these at my linky party up now. come strut your stuff. It's nice to meet you and find your sweet blog. Thanks for sharing on Tater Tots and Jello! Shades look great! Saw you latest tweet on your sidebar about the Casper movie. I feel the same way about kids movies. Did they have to put the stupid, shut up and hitting in there. Come on! Megan - I know! Before the movie ended there was 2 more B's, a D and all around foul language. I didn't even check the movie rating - silly me! I just figured Casper the Friendly Ghost would be kid appropriate! I first saw when you posted these over at Amys! so adorable! These are just faulous...would go perfect with my Halloween stuff! These lamp shades are great! I found you through Tatertots and Jello. Thanks for sharing! cute lamp shades, very cute idea!! and so festive!! Charisa, what a creative blog you have! Love it! I am now your newest follower, via the creative bloggers hop. I hope you will follow me, too! Many blessings to you! That is such a cute idea! It looks great! I'm your newest follow from the creative bloggers hop, I hope you'll stop by my new blog & follow along too! What a fun way to decorate for Halloween. I especially love the bats. Following along from Sew Can Do's Halloween Linky. These are so creative. I love simple, cute and easy project. Since I'm on a bat thing at the moment I'll be doing those. Love the lace look also. Very creative! These are adorable!!! 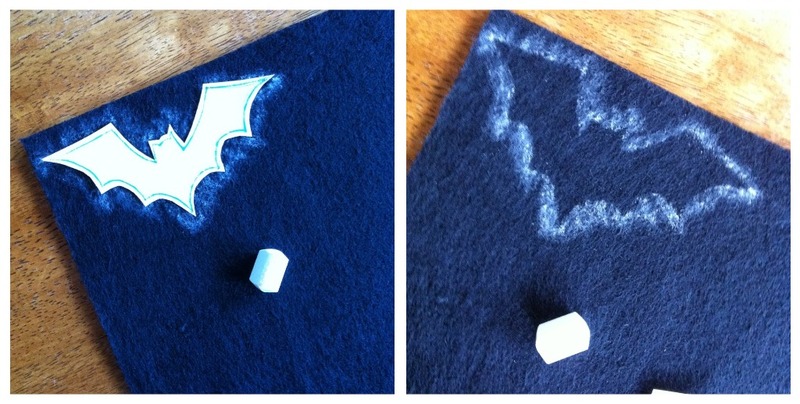 And so clever to use felt so they're easily removable! These r adorable and so awesome, lovely idea :)) I found ya on Made by you Mon and officially following ya with smile :)) Great blog you have here.. 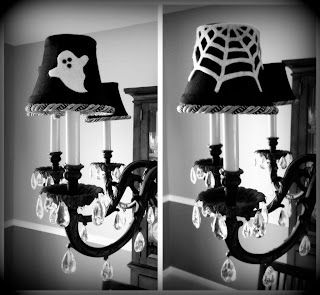 I LOVE the bats on the lampshades! My grandparents used to have silhouette birds on their window and I always thought they were so cool! Plus, I love Halloween! These are so cute! I love making fun things like that to go around the house. So much better than the expensive tacky stuff you can get at the store. so adorable. 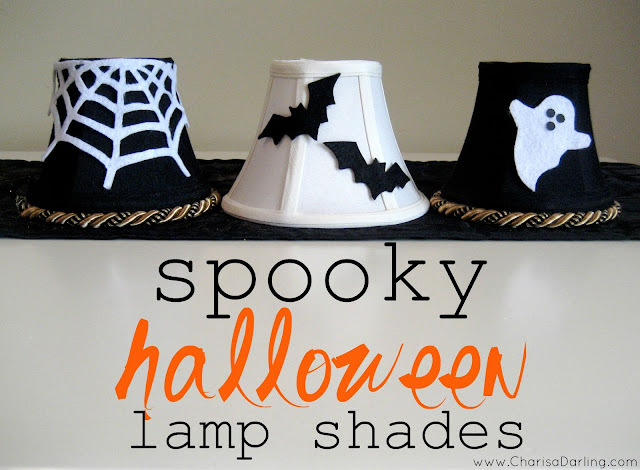 I would love for you to stop by and link up your lampshades to More the Merrier Monday. It lasts through Wednesday so you have plenty of time to link up. 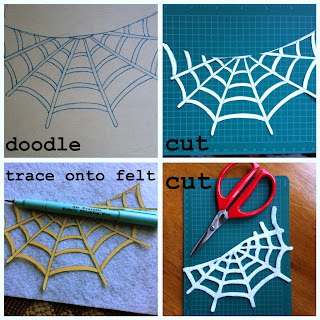 I also have a link party for Halloween projects only at http://diyhshp.blogspot.com/2011/09/trick-or-treat-link-party.html that I would love for you to link up to as well. What a sweet idea!! Thanks so much for sharing last week! I featured you this week! I would love for you to link it up to My Favorite Things Friday Party going on all week. I saw this over at the Tip JUnkie Party. What adorable Halloween decorations! Seeing the decorated lampshade reminded me that I have some black lampshades for the dining room chandeleir that I forgot about. Will save my egg carton and attempt to make those bats and buy the Halloween ribbon if I can find it at Michael's..or A.C. Moore. I'm hosting a dessert party for a neighbor's birthday toward the end of October. This will be perfect. Maybe I can find some already made up at the party or craft store. Thanks for the comment Betty! What a great idea - a dessert party! Good luck with everything! This is a great idea. I was just thinking, I could use the chandelier in my dining room. It's directly above the table that I use for food. Loving the bats. Thanks for sharing on Sunday's Best Linkup. Looking forward to seeing more posts from you.